He owned one of the hottest souvenirs of the Rio de Janeiro Games: A plastic Olympic gymnastics beer cup. “That was a good one,” Rodriguez, of Dallas, lamented. 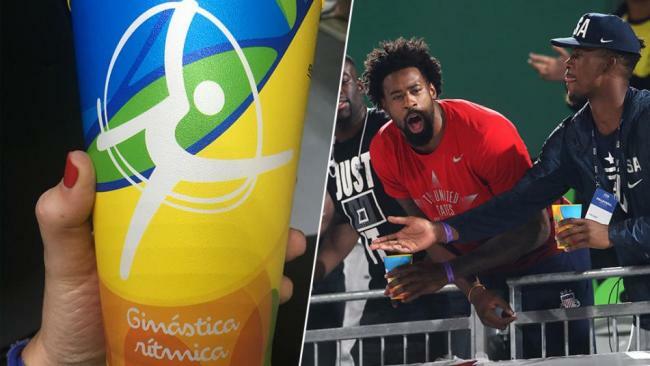 Yes, the Olympics has yet another cupping craze, though this one involves the swirling orange, blue and green color patterns on a yellow cup that include the name and silhouette for more than two dozen sports. The most common sight at Olympic venues aren’t medals draped around necks, but fans walking around with arms full, fixated on finding the next beer stand and hoarding empty cups. Sure, but fans are chugging — and sometimes just dumping — their half liters (about 17 ounces) of Skol lager simply for the empty cups. Then it’s back in line to put another 13 Brazilian reals (about $4) on the growing beer tab. That totals at least 300 reals for the set. The cups are suddenly fueling the merchandise machine and have been traded, sold, and yes, even stolen, as fans clamor for hard-to-find sports such as gymnastics and soccer this deep into the Olympics. About an hour before boxing’s Sunday evening session started, fans lined up 25 deep at some “cerveja” stands ready to go another round. The long lines weren’t necessarily because of slow pours from the can into the cup. Once at the front of the line, fans would shake through stacks of cups until they found the one sport they wanted. “Boxe! Boxe! Boxe!” one fan shouted in Portuguese in his search for boxing. “No! No!” the server shouted, as he pointed to one of the other stands at Rio Centro. So off the man went, without a beer, with a more pressing mission on tap for the night. Trampoline, tennis, equestrian, taekwondo and water polo were the most common cups found Sunday at the complex that’s home to boxing, table tennis, badminton and weightlifting. Brazilian native Sergio De Oliveira, now of Hoboken, New Jersey, wore his Team USA hat and shirt and gripped his equestrian (“hipismo”) cup. De Oliveira and husband Terry Miles are trying to collect the cups of all 14 events they’ve seen at the Olympics. De Oliveira had no idea that when he bought a gymnastics cup at the opening ceremony, the hunk of plastic would soon spark a memorabilia frenzy. “It was huge we got it all,” Miles said. Miles doesn’t drink, leaving all the beer guzzling to De Oliveira. They have about 10 cups so far, but had yet to find their No. 1 target — archery. They also wanted synchronized diving. But don’t expect the couple to auction the cups on eBay to recoup the 130 reals and counting they’ve spent on their collectibles. They are keeping most of them and will share a few with friends back in the United States. Carmen Pruneda, of San Antonio, Texas, had no interest in sipping any light blonde lager. “I’m looking for cups, but I don’t drink beer,” she said. Pruneda has traded pins for cups, and cups for pins. She hit a bit of good luck when a woman dropped a cup on an escalator. The woman asked Pruneda if she was a collector. When she said yes, the stranger gave her both of her cups, boosting Pruneda’s total to six. One beer server said it was forbidden to just buy a cup. The trinkets are a steal compared to other Olympic merchandise. Olympic hats are going for about 60 reals, T-shirts for 80 to 100 and keychains are 35. One man bought a beach towel at the souvenir stand — a soft landing spot for the three cups he then stuffed inside his shopping bag. Come to think of it, those purple circles dotting Michael Phelps’ shoulder and back from his cupping therapy do look like coasters. Maybe he wouldn’t mind serving as a true arm rest for the cups at the next Olympic bash. While stuffed trash bags and overflowing bins of Skol aluminum beer cans are a sore sight at the games, there’s not a plastic cup around to recycle. “It has been a good way to keep litter down,” Rodriguez said.